(Neukirchen-Vluyn: Neukirchener Verlag 2015), 155 Pp. ISBN 978-3-7615-6179-9. After serving for thirty years as a pastor in the Rhineland Evangelical Church, Rainer Stuhlmann is spending part of his retirement as Director of Studies at Nes Ammim, a Christian centre in northern Israel. Nes Ammim was established fifty years ago by a Dutch Reformed couple, who were convinced of the need to have a visible sign in the newly-established state of Israel of the Christian desire for reconciliation and repentance for Christian complicity in the Holocaust. They believed the best way to do this would be to follow the example of the Zionist pioneers, and build a farming community in order to contribute both practically and spiritually to building new relationships. For many years they grew roses, which were picked, packed and sent every day to the Frankfurt flower market. Some years ago, when this venture no longer proved viable, they switched to running a guest hotel, staffed mainly by young Christian volunteers from Germany, Holland and Switzerland. Pastor Stuhlmann helped to organize their free time with programs enabling them to study more of present conditions in Israel and the Palestinian West Bank. This book is essentially a record of these encounters, written as a series of snapshots from the perspective of a keenly involved observer doing what he can to enhance the growth of communal friendship and harmonious relationships. The Holy Land is of course full of holy history, also of holy geography. Stuhlmann sees his job as motivating his young guests from Europe to understand the dimensions of both these features and to encourage a courageous encounter with the many history-laced dilemmas which are met in so many corners of the “promised” land. He is clearly against the kind of religious tourism which brings Christian visitors to Israel, but seeks to isolate them in the first century without ever meeting with Israel’s present-day inhabitants or their troubles. He is equally opposed to the kind of narrow eschatological proclamation of certain Christian groups, especially some American evangelicals, or to the equally one-sided Jewish extremists who wage a continual battle against their Palestinian neighbours. He is grateful for the fact that he and his younger colleagues from Germany are now looked on as representatives of the “new Germany”, and that the horrors of the Holocaust, though loudly trumpeted in state-controlled media, are not attributed to the younger generation or to him personally. Likewise he is encouraged by the friendliness of the Palestinians who see these visitors from Europe as a hopeful sign that their cause is not being forgotten by the rest of the world. And he draws hope from the fact that there are many signs of confidence building between young Jews and Arabs, not least those established at Nes Ammim itself. Anyone visiting Israel/Palestine cannot fail to be impressed, even intimidated, by the weight of history which pervades every corner of this Holy Land. Even more forceful is the evidence on all sides of the many centuries of nation building and the equally obvious evidence of these attempts’ downfall. Stuhlmann would like to be optimistic, but is obliged to recognize that the forces of national bigotry and self-preservation have a long start. Every time he takes parties of students to Jerusalem, they are confronted with the most recent evidence of the endemic hostility between Israelis and Palestinians, namely the so-called Separation Wall around the city, which was constructed a few years ago. This was built as a barrier against terrorist attacks but has since been extended to expropriate large sections of Palestinian land holdings and vineyards, which he sees as a most brutal robbery by the Israeli state. This Wall in fact forbids the inhabitants from the Palestinian side crossing into Jerusalem without control, and hence denies the opportunity to have social contact or conversations. This is exactly the contrary to Nes Ammin, where such relationships are deliberately encouraged. It all points to the fact that, in the ancient capital, where three religions have existed in rivalry for centuries, and every stone witnesses to unresolved conflicts, the atmosphere is much sharper and confrontational than in northern Galilee. But given the escalation of conflict in all the surrounding countries, the hope that Israel will maintain a precarious peace and allow more positive steps for creative relationship between the inhabitants must be seen as an exercise in faith. Stuhlmann is well aware that the history and the land of Israel have been and still are full of promises. Some are extravagant, some are unfulfillable, but all contain at least the hint of conflict. For this reason he avoids giving support to any of the limiting or exclusivist claims, whether political or religious, which are put forward to back one or other of the opposing sides. But to act as a reconciler, it is necessary to face both ways. Praying with the Psalmist for the peace of Jerusalem may seem a lost cause, but for Stuhlmann it is the only and most heroic stance to adopt in the midst of the present Middle Eastern strife. He places his hopes in what Nes Ammim has always done best, which is to bring together young people from both or all sides, and hope that their personal contacts will allay hostilities and rivalries, and that they will then go on to work for a resolution, or at least the alleviation of the tensions so visibly shared by the inhabitants of this Holy Land. He is sustained by the memory of how, in Germany, for forty years from 1950 onwards, two sides across the Iron Curtain adopted the same kind of biased and obstinate prejudices, and refused any kind of personal interaction across the well-defined and defended border. But then in 1989 all barriers were broken down, and humanity reigned again. But in Israel, the separation has now lasted for fifty years. And a very deliberate policy of “Boycott, Disengagement and Sanctions” has only increased the suspicions and hostility on both sides. While there are those on the Jewish side who recognize that the occupation of the West Bank and oppression of the Palestinians is a catastrophe for their vision of Zionism, their advocacy of a two-nation solution has achieved nothing, and indeed still raises doubts about its viability. Equally there are those on the Palestinian side who refuse any contact with Jews. Stuhlmann naturally deplores such intransigence or the unwillingness to enter into dialogue even on a personal level. He realizes how difficult a task it remains to be supportive of the Palestinians without becoming an opponent of the Israelis. But he also deplores the widespread anti-Muslim and anti-Arab animosity stirred up in many western countries. Above all, he rejects the continued use of Israeli force to humiliate the Palestinian population under its control and to deny the destructive impact of their land confiscations or the malignant policies of establishing more settlements in the West Bank territories. He is convinced that such tactics seriously damage the Israeli cause, and he knows how offensive such policies are to the many Jewish friends he has found in Israel. The quest for both security for Israel and freedom for Palestine remains elusive and seemingly distressingly distant. The human toll is incalculable. Zwischen den Stühlen is chiefly directed to his German audience in the hope of inducing a more balanced presentation of Middle Eastern politics. He cannot avoid the feeling that the widespread sympathy for the Palestinians will be interpreted, by some Jews at least, as a replay of the anti-Semitic attitudes shared by many Germans in previous decades. And the call in some western cities for a boycott of Israeli-produced goods evokes a reminder of the similar boycott organized by Josef Goebbels in April 1933. On the other hand, those Germans who loudly profess themselves to be Friends of Israel are seemingly willing to overlook the gross injustices inflicted on the Palestinian population in what they refer to as their “Nakba” or catastrophe. 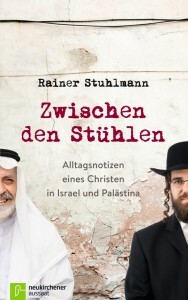 Similarly Stuhlmann regrets the enthusiastic support given to Israeli policies by the right-wing Evangelical Christian Zionists, eagerly awaiting the return of the Messiah. In his view, all such confrontational attitudes can only be harmful for the cause of peace. But at the same time, he greets enthusiastically all demonstrations against anti-Semitism, which must be resolutely opposed. Part of the problem is that both sides like to portray themselves as victims. Israelis harp on their status as survivors of the Holocaust of seventy years ago, and Palestinians see themselves as the victims of a hundred years of Zionist aggression. Both sides justify their defensive measures accordingly, which successfully prevent the growth of any climate of accommodation or agreement. Nevertheless Stuhlmann and his team of expatriate volunteers remain dedicated to their aim of reconciliation and mutual understanding. Nes Ammim is situated near Acre. As a Christian centre, it stakes a claim to be a place of peaceful encounter for all faiths. But in 2013, it was itself the near-target of rockets fired from somewhere across the Lebanese border. Neither the aggressors nor the reasons for the attack were discernible. But the Israeli defence shield saved it from further damage. The paradox of being protected by the military power he has so readily criticized for its mistreatment of its Palestinian population did not escape Stuhlmann, and only heightened his awareness of the difficulties of trying to face both ways. Steering such a course in the often polarized climate in Germany makes Stuhlmann’s message of reconciliation and inter-faith dialogue even more hazardous, but equally even more necessary. He is in fact attempting to express solidarity with both Israelis and Palestinians without attempting to judge or condemn either side. This short book will undoubtedly assist those who look for the spirit of Nes Ammim to be vindicated in the troubled circumstances of the Holy Land today.